Developer Certain Affinity is working on the Forge engine for Halo 4. Following a tweet issued during the Rooster Teeth Expo in Texas this weekend, developer Certain Affinity has confirmed it is working alongside 343 Industries on Halo 4. Certain Affinity is working on the mapmaking Forge tools and user interface. Certain Affinity said they were "honored" to be working on the franchise again. The Expo showed off several of the Forge's upgraded features - the ability to lock objects on the map, or to easily duplicate them and attach them to other objects - designed to make map creation significantly easier. There are all sorts of nifty tools set to be available to players via Forge; everything from gravity manipulation to run speed and jump height boosts. Halo 4 is the first installment for the franchise developed exclusively by 343 Industries. The 343i studio was created by Microsoft to take care of the franchise after Bungie left the Halo brand it had created. 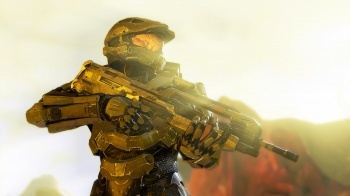 Halo 4, the first installment of a new trilogy, is set for release in November this year.